Wassily Kandinsky artwork is of the most influential and sought after from the period of World War II, but the story of this amazing artist and his oeuvre of distinctive Wassily Kandinsky paintings begins far earlier. 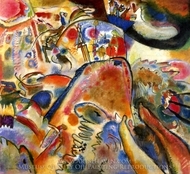 Kandinsky, born in Moscow in December 1866, was a fine legal mind before he became a great painter. 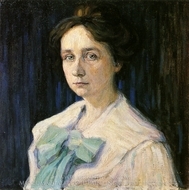 As a young man, he was associated with many avant-garde artistic movements throughout Russia and Germany, including Der Blaue Reiter. 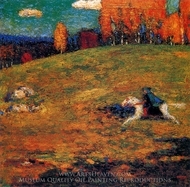 This association of Russian and German artists took its name from an early Kandinsky painting of a man on horseback. 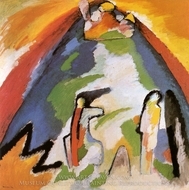 Kandinsky paintings were influenced by the artist's deep spiritual and philosophical beliefs. 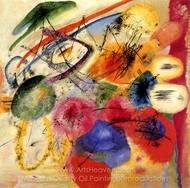 All Wassily Kandinsky artwork demonstrates the artist's focus on the evocative power of color. In fact, Kandinsky was one of the first modern artists to write in detail about color as a crucial tool of the artist's inner vision. 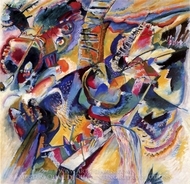 As Kandinsky matured, Wassily Kandinsky paintings became known for their experimental nature. 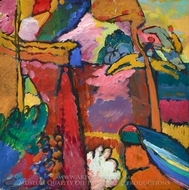 Kandinsky not only experimented with color and shadow, but also became one of the first modern European artists to value non-objective abstract paintings. 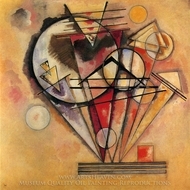 "Non-objective" art, which represents the majority of Kandinsky paintings, is art in which no figures are depicted. 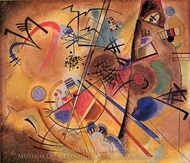 Wassily Kandinsky artwork was among the first in Europe to break with the long tradition of objective depiction. 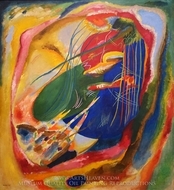 Kandinsky paintings are daring in their use of bold colors and "pure forms" to create an unfettered aesthetic experience. 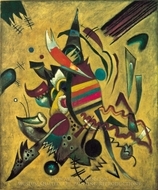 A true Kandinsky painting invites -- even dares -- the viewer to contemplate the transcendent in an unusual mode, completely separate from recognizable objects. 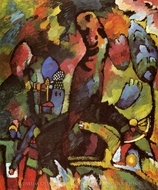 Wassily Kandinsky oil paintings and color theory became an important part of the Bauhaus movement, which flourished in the urban centers of Germany during the Weimar Republic. 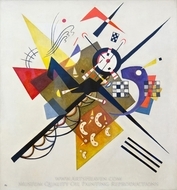 Kandinsky became a Bauhaus "master," or senior teacher, during the studio's heyday in the 1930s. Unfortunately, the vision of the Bauhaus' intellectual leaders, Walter Gropius and Mies van der Rohe, had little room for decorative painting. Instead, Bauhaus artists focused on purely functional objects, laying the foundation for what would become modern architecture. Over time, Kandinsky found himself unwelcome among his Bauhaus colleagues, even as he drew unwanted attention from Nazi officials. 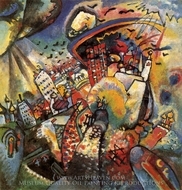 Wassily Kandinsky was, without a doubt, one of the artists most hated by the Nazi regime. In his megalomaniacal efforts to control all artistic production in Germany, Hitler targeted artists with abstract styles first and foremost. 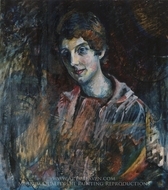 Hitler and his hand-picked cultural bureaucrats were furious when exhibitions intended to show ordinary Germans the "decadence" of abstract art and resulted in high praise from visitors, many of whom rated the art of Kandinsky and colleagues more highly than that of approved Nazi artists. This attempt at censorship has helped Kandinsky painting become associated with the quest for freedom of artistic expression. 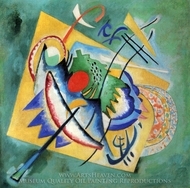 Oil reproductions of Wassily Kandinsky artwork by ArtsHeaven.com is intended to provide 100% fidelity to the artist's bold use of color and the complex interplay of his forms.